1 Utama's Ramadan Bazaar is back with a classy deco ! On the 2nd June 2017, I stepped into 1 Utama and was surprised to see how much different the decoration for the Ramadan and Raya ! Unlike other shopping malls, I always seen 1 Utama as a classy mall with various of universal brands and offers in their shopping mall. And they did surprised me with a classy touch of traditional malay inspiration decoration. The combination of batik and modern wood art of their stalls at their LG Oval did caught my attention ! Highstreet and Centre Court too ! A pic with the promoter for Guylian Chocolate ! And with the famous Sunshine Kelly ! At the LG Oval of 1 Utama, The theme of this year Sinaran Sanubari Syawal is placed with various bazaar selling from beautiful Baju Raya, Kebaya, Raya delicacies, Guylian Chocolate and even a stall where you can get some Indonesian Massage ! I love the decorations this year with such elegants lightings and beautiful batik with some tiny sequin details on the flower patterns. It's also a instagram worth place for a JOM ber-selfie ! Starting from this 1st to 30 June 2017, 1 Utama is also having a Raya Instagram Contest where 10x Prizes of RM100 Marks @ Spencer Cash Vouchers to be given out ! How to join ? Just Share photos or Videos of 1 Utama's Hari Raya Decorations and Win Cash vouchers to shop for Baju Raya and Gifts ! I sent my entry already and Hope I can get this voucher too !! 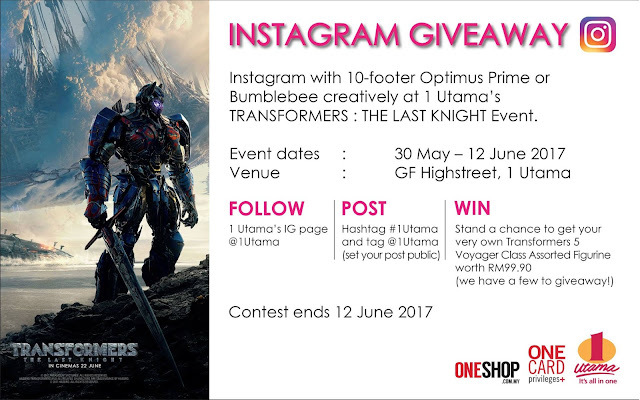 Just follow the @1Utama Instagram and Upload your Video/ Photo. ( set to public view ok ?!) And lastly, don't forget to HASHTAG #1Utama and Tag @1Utama. Easy Right ? -So what are you waiting for ?! Now for Shopping Queens and Kings for this upcoming Raya, 1 Utama is giving out this really pretty gift for those whom spent RM500 (RM300 for One Card Members). This gifts are definitely a killer for mums cause it's super useful for this coming Raya and so pretty and elegant as well. Lucky me, I got the Purple colour one and it's my Mum's favourite colour. She was so delighted to have a new thermal cover plus, a super classy canister with an elegant key chain. It's a total 3 gifts !! 1 Utama are very generous with their festive reward aren't they? Plus, you can combine 2 receipts on the same day at any of the OneCard participating Outlets ! You will also need to Redempt it on the same day of purchase and to only 1 shopper. We all know this product is gonna be redempted so fast so , as usual, it's only Valid while stocks lasts and first come first serve basis. Just notice this at The G floor Oval and the Redemption Corner is just by these manequins. Well if you are an Online shopping fan , you also will get a RM10-eduit Raya for every RM150 spent on oneshopcom.my . I can't believe even sitting at home clicking BUY could also have such discount. In conjunction with Ramadan and Raya, 1 Utama will also be having various of Festive Performances at the LG Oval as well as the GF Centre Court. On 12th June,2pm,There would be the Miss Malaysia Petite Spokesperson 2017 Catwalk Show. 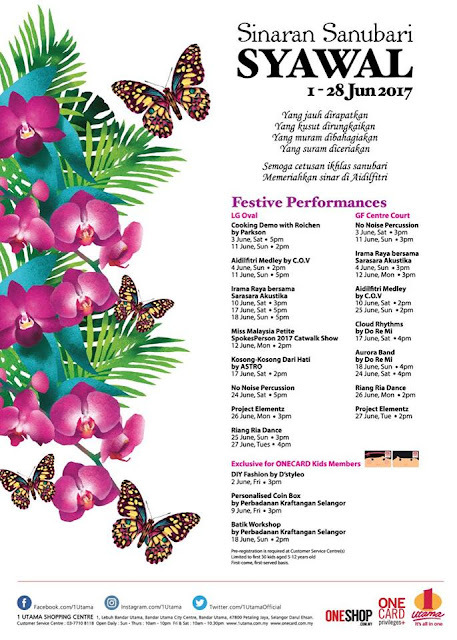 1Utama's LG Oval on 12th June , 2pm to enjoy their catwalk show. Do you even know this year their Phamplet can also be folder into a Duit Raya ?! I Love their design so much ! It's limited so get yours free at their conceirge ! In addition,they also have a green screen for photo shoot session and a corner screen for the Movie preview of Transformers: The Last Knight movie. There is also an Instagram Giveaway for the Transformers : The Last Knight Event so don't missed out winning a Transformer Figurine ! Enjoy all these perks while doing your Raya festive shopping in 1 Utama ! Have a lovely Ramadan month ! I can't wait for Hari Raya 2017 !